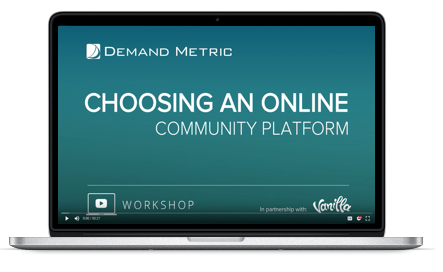 Learn the top considerations when selecting an online community solution with Demand Metric. This is a vendor agnostic webinar helping you make the best decision for your organization. Are you currently looking into acquiring a new community platform? Selecting the wrong community platform can be a costly mistake. That's why picking the right one is a decision that deserves careful consideration and targeted research. In order to pick the right solution for your organization’s unique needs, you must have a comprehensive requirements checklist and structured vendor selection process in place. Watch John Follett, Partner & Analyst at Demand Metric, and Mél Attia, VP Marketing at Vanilla, as they share expert tips and a vendor agnostic buyer’s guide (which includes 12 practical tools & templates) that will put you in the driver’s seat throughout the selection process. Fill in the form, and watch right away, without any delay!